Commentary on each Bob Dylan album and other related recordings. In 1973 Bob Dylan made his acting debut in Pat Garrett and Billy the Kid. Directed by Sam Peckinpah and filmed in Mexico, the film has remained a curiosity of 1970s cinema. The story follows Pat Garrett (James Coburn), a one time compatriot of Billy's (Kris Kristofferson) who eventually joined law enforcement. Local landowners hire Garrett to recruit a posse to hunt down and kill Billy. Dylan plays a character named Alias, a sort of flaneur who drifts between the worlds of "the kid" and Pat Garrett. What can you say about Dylan's acting? It's like he wandered in from some other movie set. If anything his presence adds a mystical atmosphere to the film. As a tone poem on the end of the West and the creation of myths, one can see why the material appealed to Dylan. Upon its initial release in 1973, audiences saw a heavily edited version not reflecting Peckinpah's vision. In the years since, many restored versions have appeared and the film gained new life as an important revisionist Western. Dylan wrote most of the soundtrack, including one of the most popular songs in his catalog, "Knockin' on Heaven's Door." He played it for Pope John Paul II in Rome. I remember first hearing the song on the MTV Unplugged Concert in 1994, with Dylan mumbling the lyrics. On Before the Flood (1974), their's a more rock and roll feel. Then on the Rolling Thunder Revue (1975) bootleg, it's more of a folk rock catharsis. According to bobdylan.com he has not performed the song live since May 13, 2003. 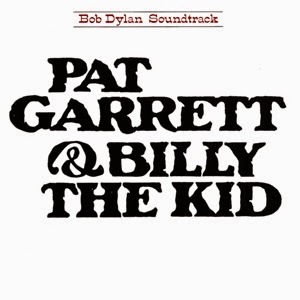 As a movie soundtrack, Pat Garrett and Billy the Kid has its moments. Most of the music is instrumental and sounds dated for the most part. Three versions of "Billy" appear. "Billy 1" has an exciting intro and enthusiastic vocal, but ends way too soon. "Billy 4" and "Billy 7" are all acoustic, with Dylan singing in a lower register on the latter version. Dylan's songwriting leveled off a bit in the 1970s and he generally kept a low profile. In 1974, he released Planet Waves for David Geffen's Asylum Records and embarked on a tour with The Band, his first one since 1966, thus beginning another solid series of albums.